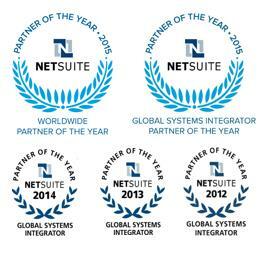 NetSuite is the world's leading provider of cloud-based business management software. Accenture enables organizations to get the most out of NetSuite’s solutions through proven design, customization, data migration and development capabilities. Together, Accenture and NetSuite leverage our market leading strengths to offer end-to-end, cloud-based technology solutions that accelerate enterprise growth. We embed leading business practices in cloud-based solutions that can be deployed quickly with minimum capital expenditure and resources. Technology platforms from Accenture and NetSuite deliver a number of benefits for clients looking to move their business systems to the cloud, including accelerated time to value, greater flexibility, lower costs, improved productivity and reduced risk. The strength of our relationship is reflected in our joint investment to train our global workforces, build solutions for our clients' most pressing problems, and to further develop joint delivery approaches, templates and toolkits. Together, Accenture and NetSuite leverage their market leading strengths to offer end-to-end, cloud-based technology solutions that accelerate enterprise growth. Buyers and sellers need to actively manage risk and complexity, meet expected timelines and control transaction costs. This Point of View addresses current M&A trends and challenges and how NetSuite and Accenture can fast-track speed to value. For executives involved in selecting, implementing, managing and optimizing Enterprise Resource Planning (ERP) systems, the advent of cloud computing may be one of the more significant and disruptive events that that they will see. This Point of View addresses key questions all executives should ask when weighing cloud ERP. With tight budgets, limited resources, rising demand and increased competition for funding, nonprofit organizations are looking for innovative ways to maximize resources for long-term success. Learn how Accenture and NetSuite can help in this offering overview. Strategic cloud ERP deployment expertise: Let Accenture help you achieve your transformation agenda using NetSuite to open new geographies, launch new product lines, and accelerate corporate transactions or build your core ERP solution on NetSuite and deploy faster than traditional solutions. Numerous custom accelerators, tools, and enhancements to NetSuite's core platform: Like no other systems integrator, Accenture offers a set of packaged accelerators—including the only merger and acquisition solution built on NetSuite—rapid deployment tools, change accelerators, and enhanced functions to NetSuite's core F&A processes. Deep industry and technical experience to deploy NetSuite: Accenture's deep industry experience coupled with NetSuite's industry-leading cloud-based business management solution allows you to move, innovate, and scale, faster…with certainty. Contact us today at netsuite@accenture.com to learn how we can help enable your transformation agenda for finance and accounting, commerce, business process effectiveness, and/or professional services automation.